Mirani Shire, an area of 3280 sq km, immediately west of Mackay, was amalgamated with Sarina Shire and Mackay City in 2008 to form Mackay Regional Council. The Shire was bisected by the Pioneer River and its major tributary Cattle Creek. The Creek's headwaters are in the Clarke Range/Eungella National Park, where the shire rose to mist-laden hills and escarpments. The shire was named after the town of Mirani, and was formed in 1913 by severance from Pioneer Shire. By then, the Pioneer River Valley was the powerhouse of the Mackay sugaropolis, with mills at Marian (1895) and Finch Hatton (1906). 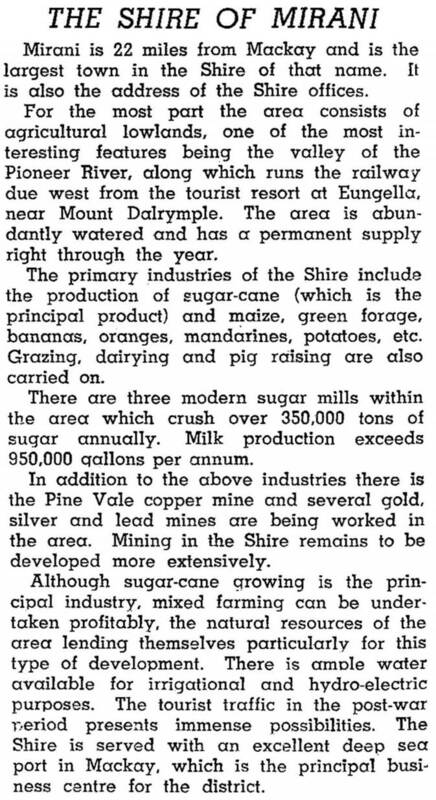 There were also mills down the valley at Pleystowe and Farleigh (Pioneer Shire) and at Racecourse, near Mackay City. There was also a considerable railway network. The valley railway had been laid inland in stages, Mackay-Mirani (1885) and Mirani-Pinnacle (1902). Extensions to Finch Hatton and Netherdale (near Eungella) and a branch to Kungari were completed in 1910-11. Both lines carried mainly sugar cane, but timber was also brought down from Eungella. Marian, closer to Mackay and with a major sugar mill, had a population higher than that of the town of Mirani. Nevertheless, the shire offices were in Mirani, near the middle of the shire. Netherdale, the railway terminus, was about seven km from Dalrymple Heights, where the Eungella Chalet was built. The Eungella National Park was proclaimed in 1936, providing a 'hill station' tourist destination. By incremental additions the national park's area has grown to over 50,000 ha. In 1922 the last of the valley branch lines was opened, running from Gargett to Owens Creek. Settlement is concentrated along the Pioneer Valley, Cattle Creek and along the branch roads (and former branch railways). Of the recorded primary schools at the various towns and localities, six continued in 2006: Dows Creek (1895), Finch Hatton (1909), Gargett (1914), Marian (1886), Mirani (1892) and Pinnacle (1908). Closed schools include Septimus (1904-99), Mia Mia (c1900-67), Mt Martin (c1937-61) and Sybil Creek (c1921-64). Occasional dry periods have troubled Pioneer Valley's cane farms and there have been several postwar water-storage projects. Beginning with the Marian Weir on the river (1952), there have followed Eungella Dam (1969), Kinchant Dam (1977-86) and Teemburra Dam (1977). A later crisis in sugar prices led to several cane farmers wanting to subdivide and sell up. They were opposed by sugar interests who need a minimum cane production to keep the local mills working economically. In 1993 the shire had 19,500 beef cattle, 3150 dairy cattle and 21,230 ha of sugar cane; 1.344 million tonnes of cane were harvested. Mirani Shire's employment profile in 2001 was led by agriculture (31% of total employment), followed by wholesale and retail (14%), manufacturing (12%), education (7%) and health and community services (6%).